The ONA conference is as much about building one’s brand as it is about sharing new skills and ideas. 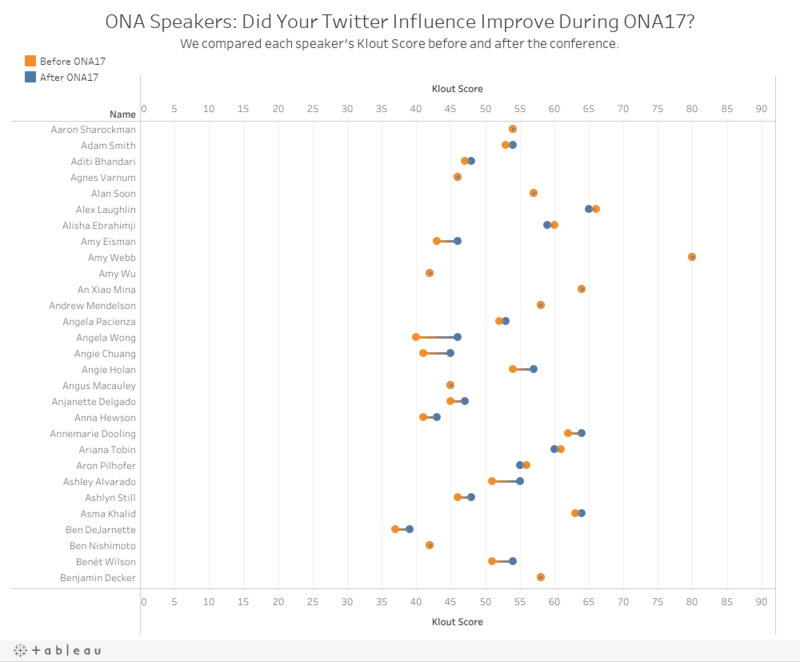 So who were the most influential speakers of ONA17, and which sessions were most impactful? 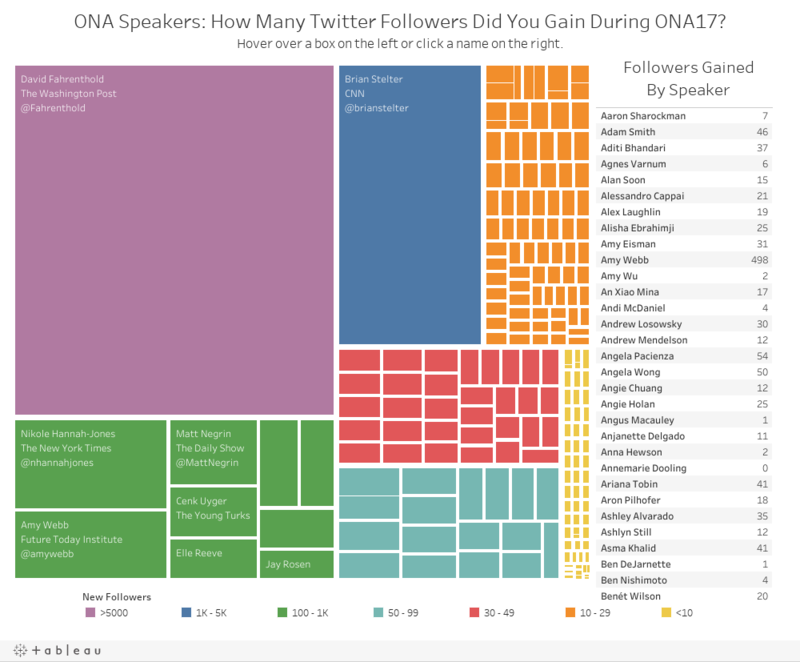 ONA speakers combined to gain at least 13,500 new followers from the beginning to the end of the conference. OJA award winner David Fahrenthold led the way, gaining 5,180 new followers, followed by Brian Stelter (1,887), Nikole Hannah-Jones (652) and Amy Webb (498). The median increase was 16 new followers. ONA session hashtags were used in more than 9,300 unique tweets during the conference. The most tweeted hashtag of conference was #ONA17trends, for Webb’s 10 Tech Trends in Journalism: 10th Anniversary Edition session, with 2,227 mentions. #OJA17 (Online Journalism Awards banquet and reception) received 1,277 mentions, and #ONA17keynote (Trust, Truth and Questions for the Media with Hannah-Jones, Michelle Holmes, Asma Khalid, Elle Reeve and Cenk Uyger) received 580. Twenty-eight percent of speakers improved their Twitter influence scores during ONA17, according to klout.com, a website that measures social media impact through an algorithm that factors in retweets, favorites, impressions and other metrics users receive on their tweets. Pete Brown, Jessica Parker Gilbert and Jacque Boltik increased their scores, which are awarded on a 100-point scale, by double digits. Using a Python library called “Tweepy,” which accesses the Twitter API, I wrote a program to scrape the user IDs of each ONA17 speaker’s Twitter followers, as well as the speaker’s “Klout Score.” I ran the program once on Oct. 4 — the day before the conference began — to collect a baseline for each metric, then ran it again on Oct. 7 — the last day of the conference — and compared the results to see who got the biggest bump. 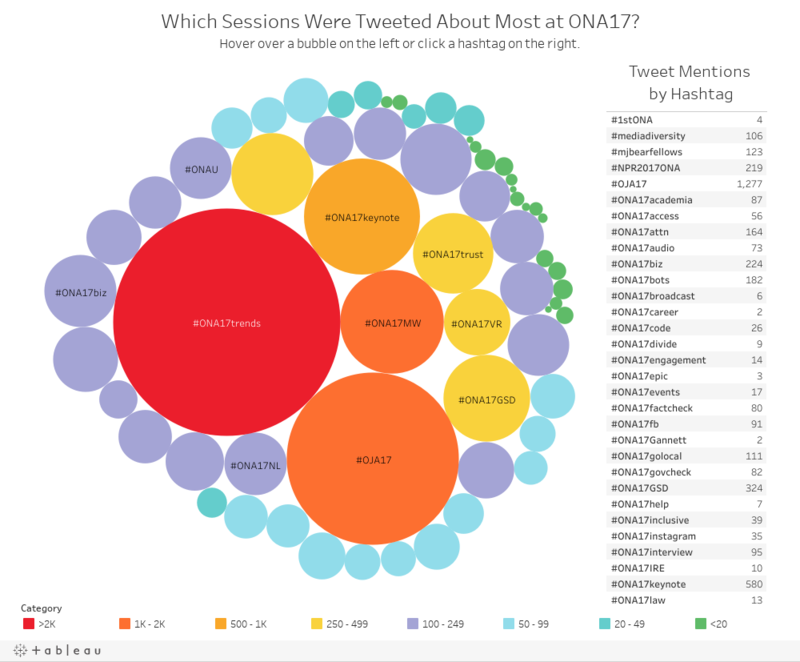 I also wrote another program that first scraped the hashtags for each session off the ONA website, then, on the last day of the conference, downloaded all the tweets in which the hashtag was used since the first day of the conference. It also pulled the date and time they were tweeted and the screen names of the users who tweeted them. The frameworks for the programs were similar to that of the program I wrote for an ONA Student Newsroom story on Oct. 5, which examined the most followed accounts by ONA speakers, the size of their audiences and their connections to accounts of other speakers. I’ve posted the full code for each of the programs in my GitHub repository. Due to deadline constraints, speaker Ev Williams, who has nearly 2 million Twitter followers, was not included in this analysis. This is because the Twitter API has rate limits that restrict the number of requests a user can make in a given time frame, and scraping each of his followers’ user IDs takes many hours to complete.